Arcadia news.. New location at Glastonbury, Updated Line-Up, Stage Times and Explosions! Fusing sculpture, architecture, fire, performance, mechanics, awe inspiring visuals and slamming tunes into a searing matrix, Arcadia are landing in their new home at Glastonbury. Tearing through the barriers of convention into a multi sensory explosion of raw energy and radiant positivity, Arcadia are primed, charged and counting down. 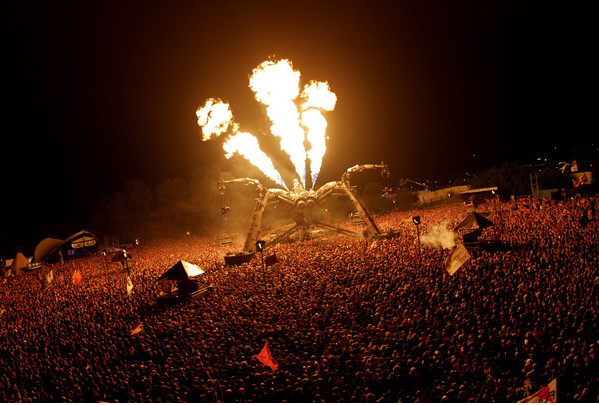 The Spider is back on the rampage at the heart of Arcadia with a scorching lineup, an expanded sound field, the Glastonbury Landing show and a new finale. With a new, permanent home by The Park, this year sees a new wave of additions to the landscape, with Glastonbury’s own Mechanical Playground. Kicking off at 4pm each day, it will include a mind bending array of creations from the Arcadia bunker, all built from recycled materials, condemned vehicles, and reworked military hardware. Arcadia can now announce the line-up times for the three days, which sees a wildly diverse cross section of artists including current house heroes Disclosure, electronic powerhouse Nero, Detroit globetrotter Seth Troxler, Greco-Roman darling Totally Enormous Extinct Dinosaurs, drum’n’bass innovator High Contrast, Numbers cohort Jackmaster, and industry veteran David Rodigan MBE take to the stage, while earlier appearances come from seasoned beatsmith Mr Scruff, carnival heavyweight Norman Jay MBE, garage pioneer DJ EZ, “riddim” fanatics Jus Now, groove masterminds Soul II Soul Sound System and more. Arcadia are proud to announce that in keeping with the spirit, ethos and culture that has driven them since their inception, Friday night will be closed out in epic style by the Arcadia Sound System. No-one knows the Spider better and no-one can intuitively channel every last ounce of its potential quite like the crew’s own DJ unit. With the original guest pulling out, it was the perfect opportunity to drill down to the core and make it about the music rather than about any one artist – the way it always should be. Fuelled by raw passion, scorching tunes and the full spectrum of Arcadia’s weaponry, Friday night will be a seminal moment as the Arcadia Sound System’s closing set leads into Arcadia’s first ever pyrotechnic and laser driven finale. While The Spider will leave you gasping for breath, festival-goers are also encouraged to try the interactive Hand of Man, a 26 foot long mechanical hand and forearm, built by Robochrist Industries head honcho Christian Ristow. Operated by a cyborg-style glove, the Hand is far more than a robotic gimmick, wielding enough strength to pick up, and crush, cars. Elsewhere, Paka and his robotic fire-breathing dragon will be patrolling the grounds, while Spitfire Forge fuses elements of sculpture and synthesizers with its caged pulse jets. Itchy Gorilla return with the Fire Tornado – a swirling column of flame developed by American artist and Burning Man regular Nate Smith, while the Bug Stage – built from submarine moulds and a star of the 2012 Paralympics closing ceremony – traverses through the crowds with its mobile rave arsenal. Arcadia’s many components and creations are born from the treasure trove of global refuse, re-embodied into unique hedonistic hybrids. From spy plane engines to helicopter blades, military hardware to junkyard gems, the Arcadian mantras of recycling, sustainability and limitless imagination are embodied in the boundary breaking landscapes it erects across festivals the world over. An epicurean jungle of epic proportions, Arcadia is made possible through hard work, ambition, and dedication to pushing the confines of expectation. With its Bristol team of engineers, dancers, aerialists, mechanics and crew, it has been painstakingly built from the ground up, ignoring cynics and naysayers, ever championing their mechanical, adrenaline-fuelled crusade.